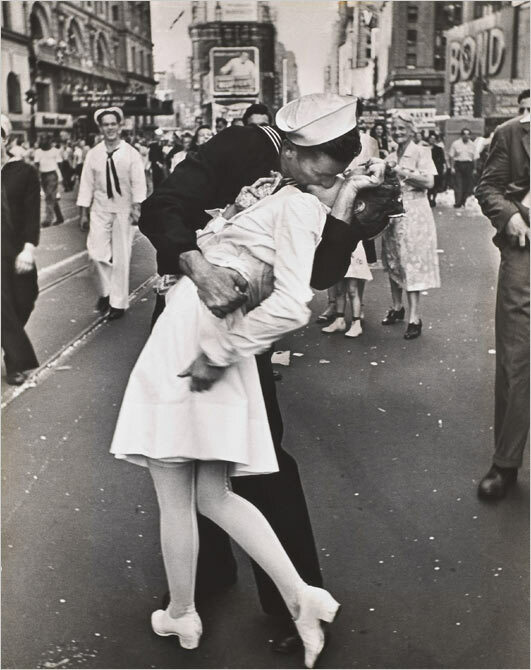 The famous photograph featuring a nurse sharing a passionate kiss with an American sailor upon the end of World War II is unforgettable. The picture was taken in New York City's Times Square by Alfred Eisenstaedt in 1945 and went on to become an iconic image ingrained in U.S. history after being published in LIFE magazine. According to Reuters, the nurse in that celebrated V-J Day photo was Edith Shain. The white-clad nurse who adorned a many postcards, posters and photos in the years to come passed away Sunday in Los Angeles, her family announced Tuesday (June 22). She was 91. Apparently Shain's identity in the photo wasn't confirmed until three decades later, when she reached out to Eisenstaedt in the late 1970s. She told him that the photo was taken on August 14 when she was working at Doctor's Hospital in New York City. The identity of the sailor remains unknown.